The Ice Cream Man a quality producer of delicious hand-crafted ice cream and ice cream desserts. As a family-owned business, we strive to deliver a taste and atmosphere that our customers will go out of their way to enjoy! That is why we have been producing our own premium handcrafted flavors for over three decades. Why are we unique? We make all of our own ice cream onsite, using the old fashioned batch method of production. We use only the freshest ingredients, including quality cream from local dairies, along with the best ingredients we can find. Over the years we have handcrafted more than 300 custom recipes that we use to produce the highest quality flavors of ice cream around, just one batch at a time! Some of our most popular flavors include Almond Joy, Black Raspberry, Butter Pecan, Danish Cream, Coffee, Orange Pineapple, Coffee Brandy, and plain Vanilla, which is our best seller. We also serve delicious soft-serve custard. Soft-serve custard has a velvety smooth texture and is dense and creamy. It has a richer flavor and less air than regular soft-serve ice cream - taste the difference! 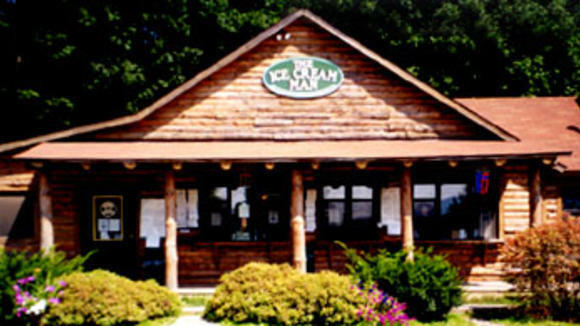 Whether served on a cone, in a dish, or in one of our many desserts, one taste and you will see just why people consider the Ice Cream Man as legend-DAIRY! Our production and retail sales activities occur at our shop on Route 29, just in Greenwich, New York - about 20 minutes from Saratoga Springs, New York. Our handcrafted ice cream and ice cream cakes are also featured at many local establishments including Hannaford Stores (in Greenwich and Saratoga, NY); Mouzon House Restaurant (in Saratoga, NY); Smith’s Orchard & Bakery (in Ballston Spa, NY), and the Saratog Race Track , just to name a few. The Ice Cream Man was also featured on the Food Network show "Throwdown with Bobby Flay", which inspired one of our famous desserts - the"Throwdown Sundae"! Just taste one of our distinctive handcrafted flavors and you will see why so many people consider The Ice Cream Man to be the only man worth chasing! Extraordinary Handcrafted... Premium Ice Cream... In Distinctive Flavors... Serving the Capital District for over 30 years!